Kathy High is a visual/media artist working in the intersections of art and biology. She produces videos and installations posing queer and feminist questions into areas of medicine/bio-science, science fiction, and animal/interspecies collaborations. Her art works have been screened in galleries and museums nationally and internationally, and she has received awards from the Guggenheim Foundation, the Rockefeller Foundation, the National Endowment for the Arts, among others. High is an Associate Professor of Video and new Media at the Department of Arts at Rensselaer Polytechnic Institute, Troy, NY, a department specializing in integrated electronic arts practices. She teaches digital video production, contemporary media art history and theory and has been working in the area of documentary and experimental film, video and new media for over twenty years. In the last ten years she has become interested in working with living systems, animals and biology and art. She was a founding member of the BioArt Initiative at Rensselaer Polytechnic Institute, Troy, New York. Kathy High was a SymbioticA artist-in-residence in 2009. She returned to SymbioticA in 2010 with Fellowship support from the John Simon Guggenheim Memorial Foundation. The Vampire Study Group (2009-2011) is an interdisciplinary, conceptual art project that takes form in sculptures, films, performances and writings. All pieces are research-based speculative fictions dealing with themes of life, death, and biotechnology. VSG projects specifically look at the body, the biological manipulation of life, and present a dystopic view of the future of the human species. Blood Wars is an artistic research project that looks at the biological reaction of human white blood cells, and questions traits inherited through blood. Blood Wars will be set up as a competition in an ironic simulated tournament where different individual’s white blood cells vie for dominance in the Petri dish. Blood Wars playfully engages with age-old debates about blood traits and engages in discussions of the powerful histories of blood. Blood Wars will be set up as a series of play-offs. The cellular ‘winner’ of each round will go on to fight another participant. By participating in Blood Wars, one will come to a better understanding of the processes of blood cell division, cell staining, immune cells and the immune system functioning, time-lapse microscopy and laboratory protocol. Blood Wars will collect data and engage in blood duals over a period of one year. 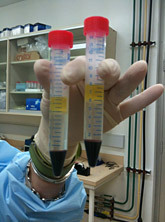 The resulting data and histories about blood will be posted on a dedicated website. Recordings will be made from the rats in ‘happy’ situations to create a sound track using primarily FM 50-kHz USV that is musical in nature. We will play the soundtrack to the rats when they are in the stressful situations during various situations to see if their stress is reduced and the rats respond more positively (following the theory that laughter is contagious for humans…). The playback USV soundtrack will be composed in collaboration with Jesse Stiles, an experimental musician and composer from USA. 21 Pigs (working title) is a video documentary about death and decay, and eco-friendly or ‘green’ burials. Dust to Dust was shot in Western Australia and follows the collaboration of a young fashion designer/SymbioticA artist-in-residence Pia Interlandi, and a UWA forensic scientist, Ian Dadour. An experimental research project was created between them, allowing Pia to test out her fashion-for-the-dead and Ian, an entomologist who studies human homicide, to research clothing decay on dead victims. Pia and Ian washed, dressed and buried 21 dead pigs on a kangaroo reserve. Then they dug up the remains to examine the decay of the ritual burial garments. 21 Pigs follows the entire process from gathering the slaughtered pigs to the results in the laboratory. This video looks at our care for the dead - be they human or non-human animals. 21 Pigs is a 56 minute documentary, directed by Kathy High with Cynthia White, the project is shot on HDv and is in the post-production stages at present. High was introduced to the theory and demonstration of taxidermy by conservator Kirsten Tullis at the Western Australian Museum in 2009 and will pursue this further with bird taxidermy in 2010.